The Raqqa operation closely mirrors the Mosul operation both politically and militarily. Politically, it was launched amid disagreements and a lack of clarity about which local and international forces would participate and who would govern the city post liberation. Militarily, ISIS used the same strategy it used in Mosul aiming to exhaust the attacking forces with the use of improvised explosive devices instead of direct combat. ISIS also retreated from positions near the borders of Raqqa and took more fortified positions inside neighborhoods with narrow streets in an attempt to change the battle into an urban combat nature. The battle uncovered critical weaknesses in the Syrian Democratic Forces (SDF) and its ability to fight alone. The SDF required heavy cover fire from Coalition forces as well as direct involvement of American and French forces, which deployed paratroopers in the area and changed the course of the battle by taking control of the Euphrates Dam and Tabqa Military Airport. The tense political environment and the various interests of regional and international players will significantly impact the battle for Raqqa and future battles against ISIS in Syria. This paper projects four scenarios about how the Raqqa operation and future operations could play out. First, the United States’ continued dependence on YPG-dominated SDF forces as its sole partner, which will exacerbate tensions with Turkey. Second, a new agreement or arrangement between Turkey and the U.S.
Fourth, the latest Astana agreement, which could set the groundwork for the U.S. to open the way for all Astana parties to participate in the Raqqa battle. The most important contribution of the U.S. in Syria was undermining the “post-Aleppo status quo”() established by Russia in an attempt to create an environment more consistent with an American policy that is more involved in the Middle East, especially in Syria. On May 18, 2016, the Syrian Democratic Forces (SDF), of which the predominately Kurdish People’s Protection Units (YPG or PYD) form the main fighting force, launched an operation with a few American and French Special Forces and International Coalition air support to take Raqqa from ISIS control. According to the SDF, the battle ended on May 31, 2016, due to fierce resistance by ISIS fighters and the widespread use of mines in the rural areas surrounding Raqqa. At that time, the battle for Manbij was announced. The SDF seized control of Manbij on August 12, 2016, after which the battle for Raqqa was relaunched. In its first three phases, the battle for Raqqa achieved its desired goals: cutting off supply routes and lines of communication between ISIS’s Iraqi and Syrian branches, isolating and besieging Raqqa, and finally preparing for the offensive attack on besieged Raqqa, which is the fourth and final phase of the current operation. The Raqqa operation closely mirrors the Mosul operation both politically and militarily. Politically, it was launched amid disagreements and a lack of clarity about which local and international forces will participate and who will govern the city post liberation. Militarily, ISIS used the same strategy it used in Mosul aiming to exhaust the attacking forces with the use of improvised explosive devices instead of direct combat. ISIS also retreated from positions near the borders of Raqqa and took more fortified positions inside neighborhoods with narrow streets in an attempt to change the battle into an urban combat nature. Furthermore, the battle uncovered critical weaknesses in the SDF’s ability to carry out the fight alone. The SDF required heavy air support from Coalition forces, as well as direct involvement of American and French forces, which deployed paratroopers in the area and changed the course of the battle by taking control of the Euphrates Dam and Tabqa Military Airport. This paper analyzes the various political contexts surrounding the battle for Raqqa and breaks down the interests of the local and international actors involved. Furthermore, this paper projects scenarios about the governance of Raqqa post liberation, which is expected to have a significant impact on a political settlement and the future Syrian state. The U.S.-led International Coalition decided to launch the battle for Raqqa depending solely on the SDF. Other groups that had previously been excluded from operations in Syria—until now—rejected the Coalition’s decision. However, similar to the way the US led international coalition initiated the operation in Mosul, their decision reflected two things: 1) the Coalition’s need to open a battle front in Syria in support of the Mosul operations, and 2) the desire for the operation to focus on fighting ISIS without allowing any participating party to exploit the battle for its own interests. Therefore, it seems that America’s choice of the YPG as the main fighting force of the SDF in Syria secured American interests, particularly by enabling Kurdish forces to participate, and created more obstacles for Turkey and Russia, whose participation in the battle remains a sore point. The battle for Raqqa is yet to begin, but the circumstances, as they are, force Turkey and Russia to align their interests more closely with America’s in the fight against ISIS if they want to participate in the fight—and in shaping the future Syrian state. Interestingly, the dilemma of choosing partners and distributing roles is more difficult for the U.S. in the battle for Raqqa than it was in the battle for Mosul due to a number of political and military factors that make Syria different from Iraq. The battle for Raqqa will be one of the toughest for the International Coalition because ISIS has lost significant territory in Iraq and thus will put more effort into maintaining the major cities it still controls in Syria, such as Raqqa. Furthermore, the SDF’s role in the first phases of the operation to surround Raqqa revealed that the group is not capable of carrying out the fight against ISIS in Syria on its own. This is especially concerning due to the SDF’s large numbers, with some sources estimating around 30,000 fighters. Even if we accept this inflated estimate, 30,000 fighters is significantly smaller than the force of 120,000 that is participating in the battle for Mosul, which is yet to be completed. Considering these factors, it is questionable as to how a 30,000-person force could take on ISIS in Syria. Regional and international political interests are more aligned in Syria than they are in Iraq; however, participation of local actors is much less in Syria than in Iraq. Additionally, the government of Iraq maintains a national military, international legitimacy, and a reasonable level of national sovereignty to a much greater extent than the Assad-led government in Syria. Furthermore, the Kurdistan Regional Government in Iraq is a successful political project that poses little threat to other Iraqi forces. The PYD in Syria, however, is a militia that has its own political project and thus poses a threat. Furthermore, the number of international and regional actors in Iraq is far fewer than that in Syria. 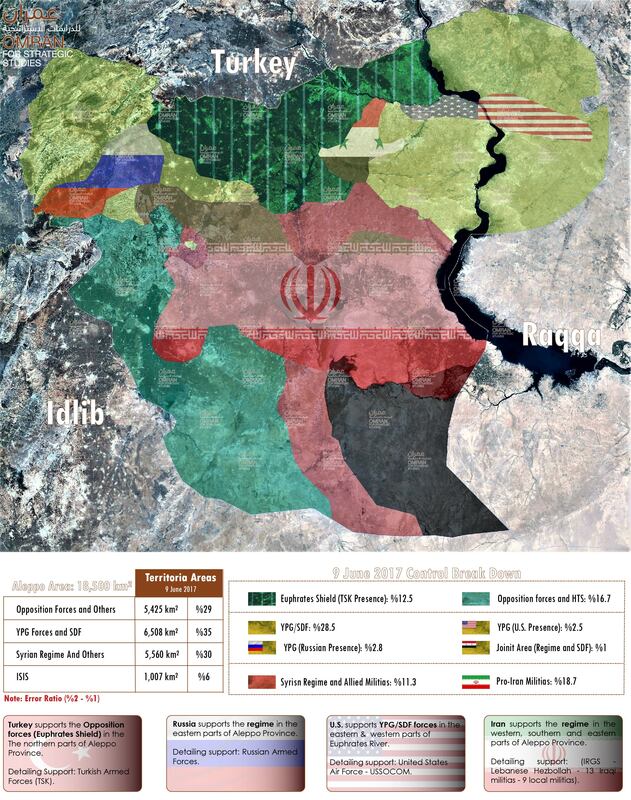 In Iraq, competition between international and regional actors is limited to the framework of a crisis between Turkey and Iran, and the Russian-American row is almost nonexistent; however, these complications are amplified in Syria. The factors described above and the various interests of regional and international actors will significantly impact the battle for Raqqa and future battles against ISIS in Syria. This was clearly reflected in the reactions of various players to the announcement of the battle for Raqqa as described below. Russia views U.S. involvement in the fight against ISIS and the increased number of American troops in Syria as a threat to its political prowess and its control of the military situation on the ground. This was especially the case during the Obama administration. In fact, launching the battle for Raqqa without coordinating with Moscow, coupled with the U.S.’s refusal to allow regime forces or Iranian-backed militias to participate, which meant Moscow would not be included either. This led Russian officials to make a number of statements demanding to participate in the operations. Moscow indicated its desire to coordinate with the SDF and the International Coalition in the fight to take Raqqa, even after the American strikes on the Sheirat Airbase and after Russia announced its cancellation of military cooperation with the U.S. in Syria. The Russian Foreign Minister Sergey Lavrov sent conciliatory messages to the Americans regarding the battle for Raqqa hoping to unite efforts between Russia and the International Coalition in fighting terrorism in Syria. () The U.S. continues to reject Russian attempts to legitimize the Assad regime in the battle of Raqqa. Instead, America has conditioned any Russian role in Raqqa on reaching an understanding about a political solution in Syria that addresses Bashar al Assad’s future role in Syria. Until now, this remains a difficult task to achieve. Iran is also skeptical of Russia’s regional activities, such as its closer relations with Turkey. Furthermore, Iran is concerned by Turkey sending military forces into northern Syria, which weakens Iran’s ability to expand. Iran is also troubled by Russia’s willingness to sell out Iran and its militias in an American-Russian deal that would protect Russia’s interests. This is especially true after Israel stepped in to pressure both Moscow and Washington to put an end to the presence of Iranian-backed militias in Syria. The PYD is taking advantage of America’s predicament in choosing its best allies by presenting itself as a lesser of two evils for the U.S. The YPG is also trying to show flexibility by complying with American demands, such as including as many Arab fighters as possible in the fight for Raqqa and announcing that Raqqa will be administered by a local council comprising residents of Raqqa while still a part of the “Democratic Nation,” according to Salih Muslim, current co-chair of the PYD. () For its part the YPG and its affiliated militias’ have shown success in the battle of Raqqa their ability to play politics with major regional and international actors while avoiding increased tensions between the US and Turkey, as well as Russia and the U.S. For now, the YPG separatist project depends on agreements made by major players—and what took place in Manbij is the strongest indication of what is possible. In response to the SDF’s statements and American ambivalence, Turkey shifted yet again from threatening rhetoric to real movements on the ground similar to what took place in Manbij. There are serious reports about a possible Turkish military operation against the Kurds in northern Syria. Reports show that Turkey has sent significant military assets to the border area. In addition, the Turkish Air Force has been striking PKK() positions in Syria. Under these circumstances, American troops in northern Syria have become monitors to ensure limited military exchanges between YPG and Turkish troops in northern Syria. For this purpose, American troops were deployed to the Turkish-Syrian border to make sure the two sides do not engage. However, this does not necessitate a favorable stance from the U.S. towards the Kurds. The Trump administration is still studying alternatives to Obama’s Raqqa plan, which it believes was full of shortcomings, especially with respect to sidelining Turkey’s armed forces. What we can be sure of regarding American policy on Raqqa is that the U.S. is convinced that the Kurds must leave Raqqa as soon as they clear the city of ISIS forces. The previous U.S. Secretary of Defense Ash Carter, who indicated that the Kurds knew that they would have to hand the city over to Arab forces as soon as they took over, confirmed this. Amid this politically charged environment, the SDF announced the start of its operation to take Raqqa under the name “Wrath of the Euphrates.” Its plan was to isolate the city starting from the southern rural areas of Ain Issa with heavy air support from the U.S.-led international coalition. On November 14, 2016, the SDF announced the end of phase 1 of their operation after taking 500 square kilometers of territory from ISIS. From its start, the operation focused on the rural areas south of Ain Issa, which are easy to take unlike residential areas. However, the situation was not so simple since ISIS depended on improvised explosive devices (IEDs), which were planted randomly around Ain Issa causing serious damage to the SDF. The presence of IEDs was the main reason for the heavy Coalition strike on areas where there were no ISIS forces present. The Elite Forces of the Syrian Future Movement led by Ahmad Al Jarba after his deal with Movement for a Democratic Society (TEV-DEM). The Military Council of Deir Ezzor. Some Arab tribes from the area. In the announcement came a confirmation by Jihan Sheikh Ahmed, a spokesperson for the Wrath of the Euphrates Operation, of successful coordination with the Coalition in the previous phase and the expectation of continued coordination. The second phase of the operation lasted until January 16, 2017, during which 2,480 square kilometers were taken over from ISIS, as well as important places such as the historic Qalet Jaber. On February 4, 2017, the SDF announced the start of the third phase of Operation Euphrates Shield. This phase of the operation aimed to cut off lines of communication between Raqqa and Deir Ezzor and to make significant advances from the North and the West on ISIS’s self-declared capital. In mid-March 2017, Coalition airstrikes intensified on Tabqa and the surrounding areas, reaching 125 strikes between March 17 and 26. On March 25, an offensive was launched to seize control of the 4 km-long Euphrates Dam in Tabqa. On March 26, the dam was struck by Coalition airstrikes making it non-operational. Despite the heavy Coalition airstrikes, the YPG and its allies were unable to take the dam due to the large number of IEDs planted by ISIS. According to field interviews conducted by Omran Center, American troops landed in western rural Tabqa as YPG-led forces crossed the Euphrates River. An attack ensued on the Tabqa Military Airport from the South without striking the city itself. On the evening of March 26, the YPG announced control over the military airport and immediately after—with oversight by American and French troops—the YPG started operations to take control of the rural parts of the city. By mid-April, the city was besieged and operations began to take the city with a significant uptick in Coalition airstrikes. Airstrikes on Tabqa city during the month of April 2017 reached 215 strikes, making Tabqa the most targeted city by the Coalition during that month, as shown below. Forces involved in the Tabqa offensive: The Americans headed up the landing south of the Euphrates. French troops were present at Jabar on the other side of the river and were able to secure boat crossings for the YPG to the other side. Coalition forces wanted to take Tabqa Military Airport to make it a base for future operations and eventually for the complete siege of Tabqa. As for the YPG, its role was limited to protecting the backs of the Coalition forces and then moving in when the Coalition leaves. Coalition strikes in September 2016 destroyed the remaining bridges that crossed the Euphrates River between the Iraqi border and eastern Raqqa. Additional raids destroyed the city's bridges on February 3, 2017. The Euphrates Dam was also damaged because of the clashes and now, with a damaged control room and the introduction of melting snow, the dam's status is questionable, with the water level increasing 10 meters since the beginning of the year. The dam is now non-operational due to clashes between Kurdish fighters and ISIS, coupled with Coalition strikes. This has caused major concerns because if the dam breaks, the water could submerge more than one third of Syria and large parts of Iraq, reaching Ramadi. Again, on March 22, 2017, Coalition strikes committed another attack in Tabqa, west of Raqqa, targeting a bakery in a busy market killing at least 25 civilians and injuring more than 40 others. () On April 22, 2017, another five civilians were killed and tens were injured in a Coalition airstrike on Tabqa. Even though the SDF is dominating the headlines and appears as the ideal force to liberate Raqqa, a number of factors indicate that there is more than one plausible scenario for the liberation of Raqqa. The issue is not determined solely by the force that will do the bulk of the fighting but also, who will administer the city after it is retaken, who will go after ISIS forces fleeing the city, and who will attack the last ISIS stronghold in Deir Ezzor, Syria. The SDF is unable to carry out the fight alone, evidenced by the need for direct participation from Coalition ground forces in critical positions and the increased number of American troops in Syria. Furthermore, the SDF has been ineffective in identifying enemy positions resulting in a large number of civilian deaths and even the deaths of 18 of its own fighters. Raqqa’s geographical positioning is quite difficult to deal with. It is open to Hassaka to the northeast and Deir Ezzor to the south, which is open to Iraq’s southeast. To the west, Raqqa is open to Hama and Homs, and to the north, Raqqa is open to Turkey. This requires a complicated coordination effort between local and international forces that must participate to make any final offensive effective. There is an ongoing struggle over ISIS’ legacy and the areas that it will leave behind that cover a significant geographic area. This issue is directly linked to the shaping of a political solution in Syria, which has put the battle of Raqqa under the pressures of conflicting interests of local, regional, and international actors involved in Syria. The Trump administration found itself in a predicament when it realized that the Obama administration’s Raqqa plan depended too heavily on arming and supporting Kurdish forces. On the contrary, the Trump administration adopted a policy of improving ties with Turkey and working closely with Russia to reach a political settlement to the Syrian crisis. The U.S. would continue to exclusively depend on the YPG and make serious attempts to take advantage of the Arab forces that are currently an inactive part of the SDF. This would balance out the influence of the PYD in the SDF. After Raqqa is liberated, it would be handed to a local council that represents the local population, as is being planned for now. This scenario seems more likely if we look at the increasing number of American troops in Syria. There are also 1,000 American Special Forces deployed in Kuwait on standby ready to be called in to support operations in Syria or Iraq. President Trump has also given the army the authority to determine appropriate troop levels in both Iraq and Syria. () In this scenario, the U.S. would be able to conduct a successful operation to take Raqqa but with a significant footprint, including direct combat and an extended period. Moreover, the political issues would remain unresolved, especially with respect to Turkey. These unresolved political issues could heighten tensions between Turkey and the U.S. after the battle for Raqqa, especially since Turkey insists that the SDF refrain from taking control of any other territory and that current SDF-controlled territory be disconnected. Increased tensions with the U.S. may lead to a solution in this scenario that is something similar to what happened in Manbij. () Moscow is hoping that it can take advantage of Turkish-American tensions in order to push the participation of regime forces as a legitimate option. The U.S. and Turkey would increase their coordination in Syria while pushing the PYD forces farther away. This would happen according to one of two Turkish plans. The first is that Turkish forces enter Syria towards Raqqa from Tal Abyad and the SDF opens a 25-km corridor for them. This would mean the PYD loses control of Tal Abyad and cuts off unobstructed access between Qamishli and Ain Arab (Kobani), which is unlikely. The other option is for Turkish forces to enter from Al Bab, which would mean either attacking regime forces or coordinating with them to secure a corridor access to Raqqa. It is unclear until now if the Trump administration is willing to completely give up its coordination with the SDF. In addition, the option of having Turkish-backed Arab forces fighting alongside the SDF is unlikely since both Turkey and the SDF reject such a proposal. Turkey will not participate in the battle if the other party includes PYD forces. The Americans and Russians would reach an agreement on the framework of a solution in Syria. This would include neutralizing Turkey and enabling the participation of regime forces alongside the YPG. This scenario would be welcomed by the regime. This scenario could become more likely because of the regime’s advances in eastern rural Aleppo reaching the administrative border of Raqqa Province (Ithraya-Khanaser). The regime has also reinforced its presence in Ithraya on the way to Tabqa, as well as in Palmyra, which is a critical position on the road between Palmyra and Raqqa. The regime has also been making attempts to increase its control of more positions in the desert by attacking “Usood al Sharqiyeh” forces in recent days. () The regime also controls critical positions in Deir Ezzor, especially in the western rural areas congruent with Raqqa Province. This includes the Deir Ezzor Military Airport in the eastern part of the province, which extends to the Iraqi border. Thus, the regime puts the Coalition in a position where it has no choice but to coordinate with regime forces, either in the battle for Raqqa or in future operations. The results of the last Astana meeting to create four de-conflicted zones could be a premise for a fourth scenario in which the U.S. is more open to the participation of all interested parties from Astana in the battle for Raqqa and what comes after. This would include roles for the SDF, regime forces, and opposition forces backed by Turkey. American and Russian oversight would ensure effective implementation of the participating forces and prevent any infighting among them. The de-confliction zones proposal is the strongest evidence that such a scenario may be carried out. The de-confliction zones would essentially mean a truce between regime and opposition forces with well-defined borders in order for the parties to focus their efforts more closely on fighting ISIS. Turkey and Russia responded positively to the last Astana meeting, which followed a meeting between the presidents of Turkey and Russia, indicating that there are some preexisting agreements about Turkey’s participation in the battle for Raqqa. Furthermore, the American approval of the de-confliction zones indicates a possible three-way understanding about the battle for Raqqa. Another positive development is Russia’s reopening lines of communication with the U.S. regarding sharing and coordinating Syria’s air space. This was surprising given the deadly strikes on the Sheirat air base. Further clarification on this possible three-way understanding on the battle for Raqqa is expected following the meeting between U.S. President Donald Trump and Turkish President Recep Tayyip Erdogan in Washington, D.C. on [insert date]. The presence of American forces in Syria joining the fight against ISIS is a significant change in the Syrian arena, making the situation more complicated and the interests of the various parties more contradictory. In the meantime, the U.S. continues to take advantage of these contradictory interests. Therefore, the most important contribution of the American entry into Syria was undermining the post-Aleppo status quo established by Russia in an attempt to create a new climate that is more consistent with an American policy that is more involved in the Middle East. These new understandings are still unclear and will not be completely understood until after the defeat of ISIS. The battle for Raqqa and what comes after are the apex of these understandings, especially the shape of a future Syria that regional and international actors will decide. () Front lines defenses were shored up at the eastern edge of Operation Euphrates Shield territory with regime, Russian, and US forces creating a buffer preventing any further Turkish backed offensive.